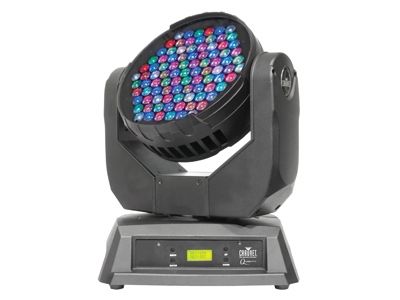 The Chau­vet Q-Wash 560Z-LED is a light­weight, LED mov­ing yoke with a vari­able zoom (six-32 degrees) ide­al for high­light­ing spe­cif­ic areas or to flood the stage with light. Pow­ered by 91 three-watt RGBAW CREE LEDs, it deliv­ers mas­sive, flick­er-free output”from the most vibrant hues to sub­tle pas­tels. A quick pan-and-tilt speed allows the fix­ture to get into posi­tion. Q-Wash 560Z-LED fea­tures three- and five-pin DMX connections.